We just can't resist the NFL this time of year, and new (old) stars are emerging. 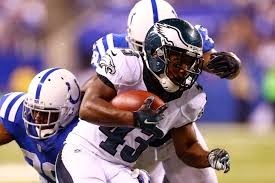 Darren Sproles of the Philadelphia Eagles looked like a man in a time machine. The 5'6" (that's one inch taller than Jose Altuve) human jackknife had eleven touches for 178 yards (26 rushing, 152 passing) as the Eagles secured a 2-0 start in hostile Indianapolis territory. More impressively, 148 of his receiving yards were after the catch. Basically, he was flipped the ball and turned the Colts defense into a video game. Sproles has been doing this for 9 seasons...the 0-2 Saints are answering some tough questions as to how they let him go.